I have been a shy introvert for as long as I can remember. I dreaded presentations in grade school, and it continued to be my worst nightmare in my adulthood. Although I got a little better through practice and preparation, I had difficulties answering curve-ball questions and I always felt disconnected from my audience when I spoke. It was frustrating that I could not share my thoughts and opinions sincerely with others. 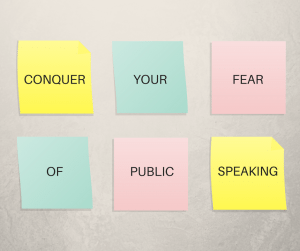 While doing some online research on how to become a more effective public speaker, I came across the “Speaking With Your Authentic Voice” class with Pamela Zimmerman. I immediately imagined a nerve-wracking public speaking course where I would stand at a podium and speak in front of an audience about things I did not really understand or know much about. So horrible and embarrassing! But then again, there will be so many more horrible and embarrassing moments in my future if I choose not to improve my public speaking skills now. Thinking it would be a perfect opportunity to practice in front of people I would never have to see again, I signed up. I thought about dropping the class several times out of cowardice, but I somehow made it to class. Looking back on it, I am so fortunate that I did not back out of this opportunity. I learned within the first 5 minutes that this class does not make you speak in front of big groups or throw crazy topics at you to ramble about. The class takes a very spiritual approach in teaching you how to remain focused on the present and to connect with others on a deep level while communicating, whether it’s with one person or to a large group of people. In one of the first exercises, we were paired up with a partner and were instructed to look at each other in the eyes in silence. Needless to say, maintaining eye contact with a stranger for 10 seconds felt like an eternity and it was uncomfortable for a shy person like myself. We then switched partners and were told that one of the partners could talk if they wanted, but the other partner would stay silent. To fill the silence, I briefly talked about how interesting this activity was, but went quiet after a few seconds, which became even more awkward than before. After switching partners a few times and doing the same thing, what initially felt like staring at a stranger in awkward silence and feeling like I have to say something, gradually began to feel like I was simply being next to another human being who is just like myself. After about the 3rd or 4th round, I could tell that the others in the group were also starting to feel comfortable and relaxed. Going through the experience and realizing that they were also feeling uncomfortable and self-conscious made me feel a strong sense of empathy towards my fellow classmates, and that feeling of connection was key in helping me understand what it meant to speak to an audience. For the next activity, the whole class sat in a circle and we took turns looking at one person in the group as they talked about whatever that came to their mind. Surprisingly, this was comfortable and easy to do since there was no need to be intimidated by anybody in the group. We worked our way up to a point where each person would stand in front of the group and talk if they wanted or remain silent if not. When my turn came up, I was surprised to see that standing in front of the group was not at all uncomfortable since we built up the connection from our previous group and 1-on-1 activities. It was strange to be able to stand in front of a group of people and able to say whatever that came to my mind with ease. We continued to build out these types of activities until we were all comfortable with talking for three, five, and ten minutes. It was a life-changing experience to be able to show my true self in front of people I had just met, speak my mind openly, and be supported by my fellow classmates and amazing instructor. In our fast-paced lives, we often feel pressured to react right away when someone asks a question. We often speak just to fill the silence and don’t make an effort to connect with people, listen to their questions, or answer from our hearts. Since taking this class, I have noticed a huge difference, not only the way in which I speak to large groups of people, but also in the way I interact with individual people. The class taught me how to be mindful, present and connected, and helped me realize what it really means to connect with other people and to speak from my heart. I highly recommend this class to anyone.